Heat oven to 350°F. Line 12x8-inch (2-quart) baking dish with foil. Fill 4-quart pot three-fourths full with water. Add 2 boneless skinless chicken breasts (about 10 oz total). Heat to boiling. Reduce heat to simmer; cover and cook 15 minutes or until juice of chicken is clear when center of thickest part is cut (at least 165°F). Meanwhile, lightly fold 8 Old El Paso™ flour tortillas for burritos (8 inch) in half and place folded-side-down in dish; set aside. 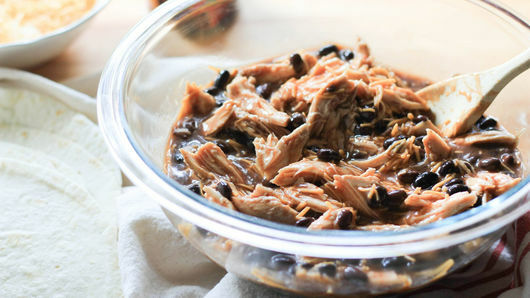 Place 1 can (10 oz) Old El Paso™ red enchilada sauce, 1 can (15 oz) Progresso™ black beans and 1 cup of the shredded Mexican four-cheese blend in large bowl. Shred cooked chicken. Add chicken to bowl with beans; stir with large spoon to combine. 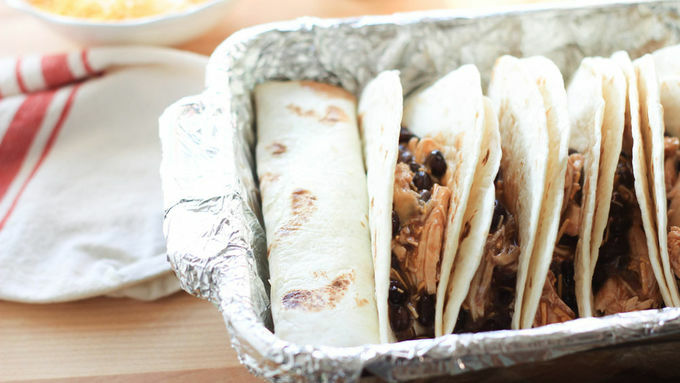 Divide chicken mixture evenly among tortillas; wrap tortillas around filling and place seam side down. 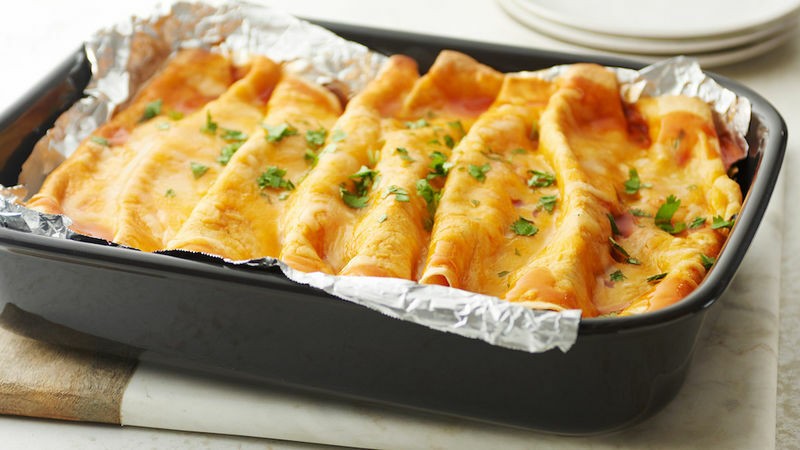 Pour remaining 1 can (10 oz) Old El Paso™ red enchilada sauce evenly over top. 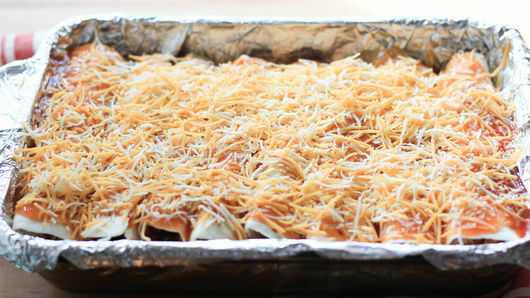 Sprinkle with remaining 1 cup shredded Mexican four-cheese blend. Bake uncovered 40 to 45 minutes or until hot and bubbly. To make this even faster and easier, use pre-cooked chicken, leftover chicken or deli rotisserie chicken. Serve with all your favorite toppings such as chopped green onions, chopped fresh cilantro, thinly sliced radishes, sour cream or Mexican crema.